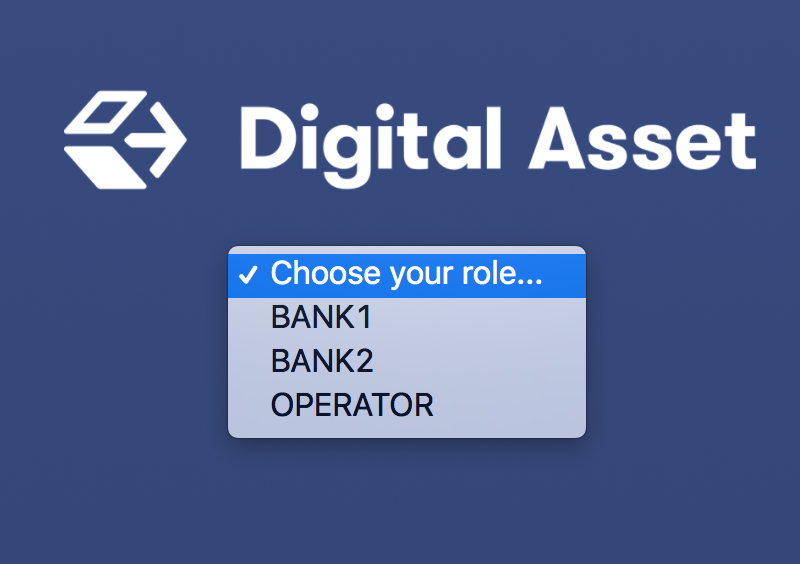 The Navigator is a front-end that you can use to connect to any Digital Asset ledger and inspect and modify the ledger. You can use it during DAML development to explore the flow and implications of the DAML models. The first sections of this guide cover use of the Navigator with the DAML SDK. Refer to Advanced usage for information on using Navigator outside the context of the SDK. When running da start you will see the Navigator URL. By default it will be http://localhost:7500/. However, if port 7500 is taken, a different port will be picked. Navigator is compatible with these browsers: Safari, Chrome, or Firefox. For information on how to launch and use Navigator outside of the SDK, see Advanced usage below. The ledger is a record of transactions between authorized participants on the distributed network. Before you can interact with the ledger, you must assume the role of a particular party. This determines the contracts that you can access and the actions you are permitted to perform on the ledger. The first step in using Navigator is to use the drop-down list on the Navigator home screen to select from the available parties. 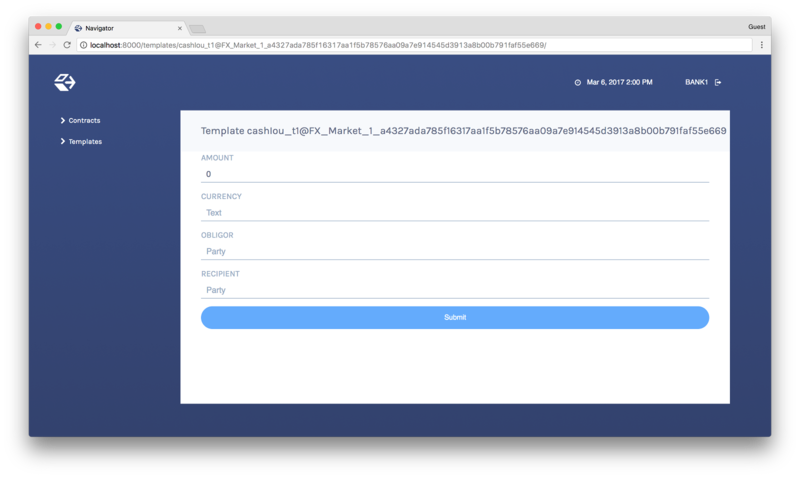 The main Navigator screen will be displayed, with contracts that this party is entitled to view in the main pane and the option to switch from contracts to templates in the pane at the left. Other options allow you to filter the display, include or exclude archived contracts, and exercise choices as described below. Click the name of the current party in the top right corner of the screen. On the home screen, select a different party. You can act as different parties in different browser windows. Use Chrome’s profile feature https://support.google.com/chrome/answer/2364824 and sign in as a different party for each Chrome profile. To log out, click the name of the current party in the top-right corner of the screen. DAML contract ​templates are ​models ​that contain ​the ​agreement ​statement, ​all ​the ​applicable parameters, ​and ​the ​choices ​that ​can ​be ​made ​in ​acting ​on ​that ​data. They ​specify ​acceptable input ​and ​the ​resulting ​output. ​A ​contract ​template ​contains ​placeholders ​rather ​than ​actual names, ​amounts, ​dates, ​and ​so ​on. In ​a contract ​instance, ​the ​placeholders ​have ​been ​replaced ​with ​actual ​data. The Navigator allows you to list templates or contracts, view contracts based on a template, and view template and contract details. 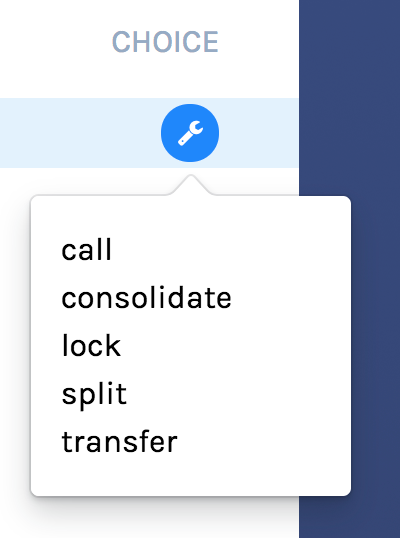 To see what contract templates are available on the ledger you are connected to, choose Templates in the left pane of the main Navigator screen. Use the Filter field at the top right to select template IDs that include the text you enter. To view a list of available contracts, choose Contracts in the left pane. Changes to the ledger are automatically reflected in the list of contracts. To avoid the automatic updates, select the Frozen checkbox. Contracts will still be marked as archived, but the contracts list will not change. 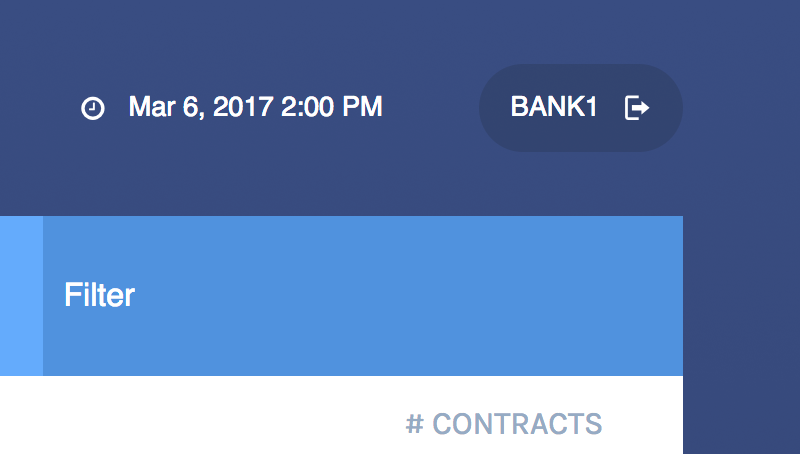 Filter the displayed contracts by entering text in the Filter field at the top right. Use the Include Archived checkbox at the top to include or exclude archived contracts. 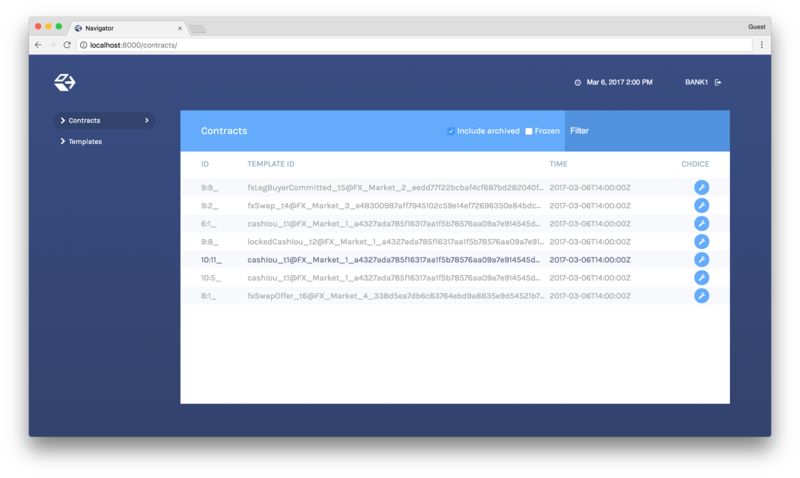 You can also view the list of contracts that are based on a particular template. You will see icons to the right of template IDs in the template list with a number indicating how many contracts are based on this template. Click the number to display a list of contracts based on that template. To view template or contract details, click on a template or contract in the list. The template or contracts detail page is displayed. 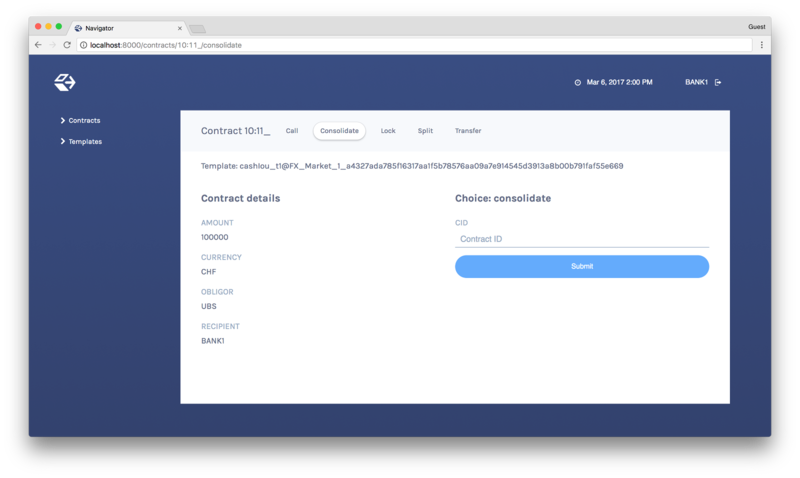 Contracts in a ledger are created automatically when you exercise choices. In some cases, you create a contract directly from a template. This feature can be particularly useful for testing and experimenting during development. Navigate to the template detail page as described above. When the command has been committed to the ledger, the loading indicator in the navbar at the top will display a tick mark. Navigate to the contract details page (see above). Click the choice you want to exercise in the choice list. Navigate to the choice form by clicking the wrench icon in a contract list. You will see the loading and confirmation indicators, as pictured above in Creating Contracts. It is possible to advance time against the DAML Sandbox. (This is not true of the Digital Asset ledger.) This advance-time functionality can be useful when testing, for example, when entering a trade on one date and settling it on a later date. Click on the ledger time indicator in the navbar at the top of the screen. 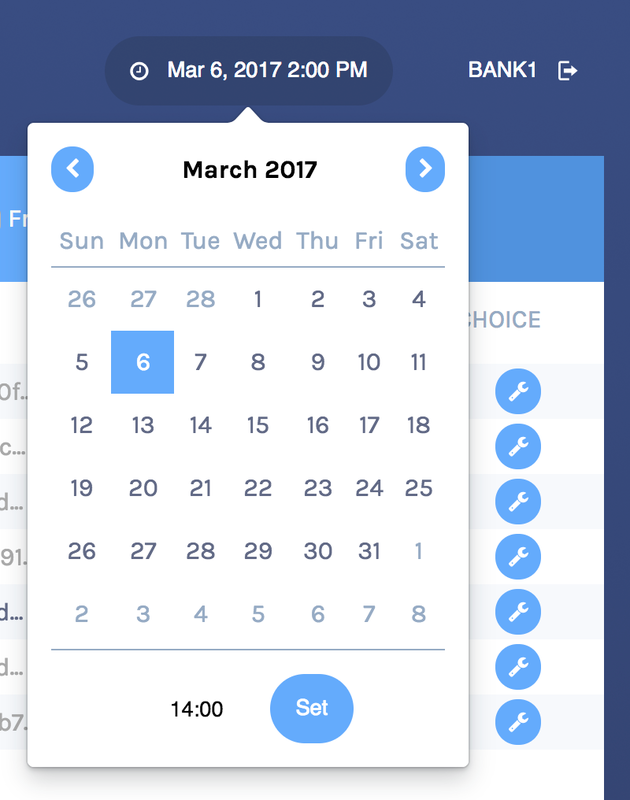 Select a new date / time. Customizable table views is an advanced rapid-prototyping feature, intended for DAML developers who wish to customize the Navigator UI without developing a custom application. Reload your Navigator browser tab. You should now see a sidebar item titled “Filtered contracts” that links to a table with contracts filtered and sorted by ID. To debug config file errors and learn more about the config file API, open the Navigator /config page in your browser (e.g., http://localhost:7500/config). The password is used only if you activate the --require-password flag. This feature is only intended for demonstration purposes and may be removed in the future.